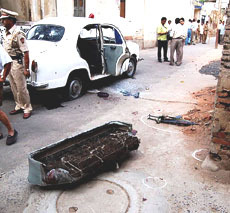 A major attempt to attack the RSS headquarters here was foiled when three heavily-armed militants were shot dead in an encounter with the police while trying to enter the heavily-guarded sprawling premises in the wee hours today. Resident doctors who resumed work after days of hunger strike, much to the relief of the government and patients, have cautioned that though the strike has been called off, they will sustain the anti-quota movement in the larger interest of the society. Buoyed by the recent triumph in the Assembly elections in West Bengal and Kerala, the Left parties adopted a more aggressive and interventionist strategy by warning the Congress-led UPA government not to hike petro product produces. Normal life was disrupted across the Valley today during a strike in response to a separatists’ call to mourn the death of 19 schoolchildren and three staff members in the boat tragedy near Watlab in Wular Lake on Tuesday. Urging the Punjab Government to take hard decisions and bold initiatives, the Punjab State Farmers Commission has recommended the taking out of small farmers, for whom agriculture has become an unviable proposition, from the traditional farm sector. Defence Minister Pranab Mukherjee, as a part of his six-day visit to China, today paid a visit to the headquarters of the Chinese Lanzhou military region — controlling the country’s largest physical area compared to other military regions. India today strongly raised the issue of Pakistan lifting ban on Indian films and television channels and, on its part, Islamabad pitched for telecast of Pakistani plays on Indian TV channels.